With a little help from......Dr. Deepak Chopra and friends! I had the opportunity to experiment becoming unplugged by escaping the tech universe for a couple of days and chilling out with the Chopra Institute. This was a dream come true! I had the privilege of attending the Living in Balance Retreat through The Chopra Center, which was held at a lovely setting, the Sheraton Westin Carlsbad Resort and Spa. While attending I also participated in my own self-imposed digital detox from the usual suspects, my MacBookPro, my new iPhone (way beyond my skillset, with all the bells and whistles) and iPad. The experience was a delight for all of the senses. Detoxing from the matrix of technology and all the accoutrements while learning a comprehensive approach to a healthy, balanced lifestyle was just what the Doctor ordered. In celebration of March 9 National Day of Unplugging, I was prepped by four jam packed days listening to best experts in functional medicine. The Chopra Center Medical experts on the leading edge, sharing the latest in self-care and the Ayurveda, the Ancient healing tradition. According to the recent study from Pew research, they were able to establish a measurement for stress that is known as the Perceived Stress Scale (PSS). To do so they created a list of 10 questions for participants to answer, which explored the relationship between a variety of digital technology uses and psychological stress. Because of this increased stress, there is a growing emphasis on overall well-being and wellness sweeping through modern culture. It is also a backlash from the influx of new addictions such as the fears of not being connected, like problematic internet use or nomophobia (no-mobile-phone-phobia). With the fast paced onslaught of technological advancements, there are now scientific studies finding a rising trend in anxiety disorders around not having access to a mobile phone. The best way I’ve found to combat these modern day stressors is to commit to a mindful meditation practice. We learned how to do the Primordial Sound Meditation. In addition to basic principles of Ayurveda, which focus on the mind-body connection, eating a balanced diet of six tastes, (sweet, salty, sour, pungent, bitter, and astringent) there are several key points. 1.Get to bed early, to experience a deep, restful night’s sleep. Have a routine that works, such as a soothing aromatherapy bath. Creating a ritual can help the body attune to a natural rhythm definitely don’t watch TV or be on the computer at least a couple of hours before bed. Reading a book is the old-fashioned way. Unplug the phone, move it out of your room or at least hide it from yourself so if you wake up in the middle of the night, do not turn it on to watch a YouTube video or facebook. The light from the phone will mess up your pineal gland and keep you more wide awake. I am still struggling with sleep issues and occasionally break that rule. 2. Wake up early and do a mindfulness meditation. Align your mind/body and connect with your spirit. If going cold turkey, don’t even look at your computer or emails. 3. Get a positive mindset before you get out of bed. 4. Get a headstart by drinking a large glass of warm water with lemon. Get out of bed and stretch, do some yoga and deep breaths. 6. Go to the gym or a yoga class and get the body moving. Then take a walk in nature and connect with all of your senses. Experience all the beauty that surrounds you and take it in deeply. Breathe in fresh air. 7. Have a healthy lunch with a bountiful array of colorful fresh, fruits and vegetables..
Meet a friend for lunch at a designated time and place (without using the cellphone). We used to do that in the old days, just make a date and coordinate. Eat a balanced array of fresh healthy, organic pure plant foods and a variety of spices, according to your dosha. Enjoy laughter! 7. Release toxic emotions as they appear. 8. Prepare a feast with friends and family at home. Gather together while each participates in making delicious food and sharing healthy experiences. Put on your favorite music and dance, sing, play! Get in touch with the vastness of the universe, enjoy the wonders of the world, the immense activity in the sky. 10. Rejoice in knowing that the world is so vast, beyond our imagination and technology is just a tool, not the raison d’etre. We are not ‘our cellphones, our computers, our social media profiles’! Each of us are powerful beings plugged into a greater source, above and beyond! While at the wellness retreat it was easy to take a break from devices because I was in a world of the leading edge wellness experts. I was mesmerized by the wisdom of the ages, with Deepak and his ‘way of the wizard’ hypnotic musings. Each speaker shared simple yet powerful principles to making better lifestyle choices. It was the most comprehensive interactive retreat I’ve ever attended and it taught me how to adapt the specific principles of optimum wellness geared to my personal body type. Yet, returning to my unconscious daily habits that have accumulated over the past few years shows me how addicted I have become to my tech devices. It has made me more mindful of how ubiquitous this is for all of us. This retreat was a lifesaver and requires a conscious effort and commitment to wake up to the hidden stressors that plague us all. I have taken to heart, the Living in Balance Challenge and am ready to take responsibility for my own health and happiness. 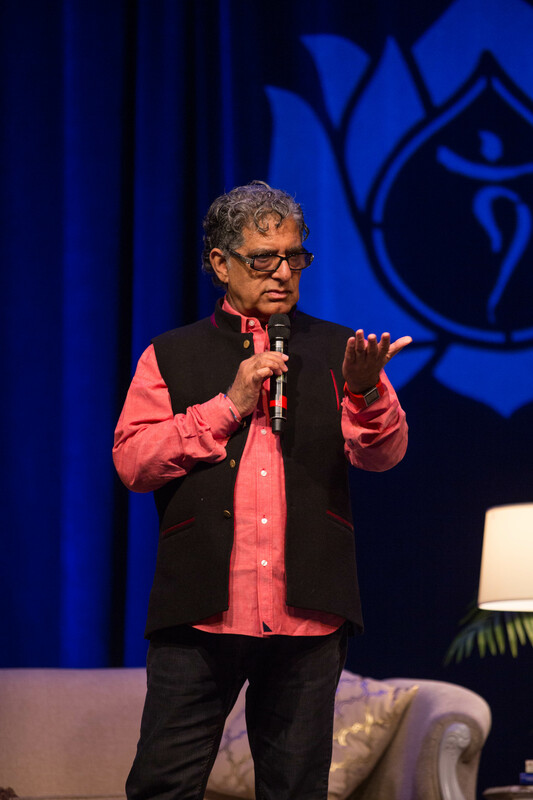 The future of health care begins with Self-Care and the best place to start is by visiting a wellness retreat such as Living in Balance with Deepak Chopra and his brilliant team of experts!